Trawangan Dive: It's a messy job..
Meet Sian Williams, Trawangan Dive’s very own Éco Warrior’. Sian came to Trawangan Dive in March 2012 to take part in a 2 week Biorock programme. Naturally, she fell in love with the Island, the Dive Centre (and the staff). She also saw Delphine Robbe , (Gili Trawangan’s original Éco Warrior’), struggling to single-handedly maintain the island’s growing Biorock, population, control the marine debris, while keeping the island clean of rubbish, and more recently, being a mum. Sian made the decision to dedicate her life, (or the next few years of it anyway), to helping with the marine conservation of our tiny island. Sian is based out of Trawangan Dive. 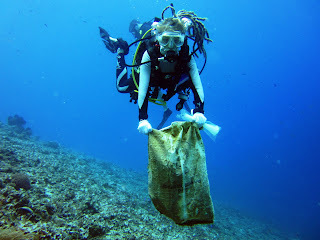 She is a PADI Open Water Scuba Instructor, and can also teach the PADI ‘Introduction to Biorock process'speciality. She dedicates her time to maintaining the Biorocks, running regular beach clean ups, dives against debris, reef check, reef gardening, island clean ups, and generally cleaning up after the thousands of people that pollute Gili Trawangan and the surrounding reefs with non-biodegradable plastic, cigarette butts, glass, flip flops, lighters, light bulbs, fishing line, and fish hooks. This kind of work usually receives little recognition or thanks, but carries with it a huge amount of frustration and stress. No sooner have you finished maintaining one Biorock, then another one breaks, or gets unplugged, or is destroyed by a storm. Moments after one beach clean up has finished, another boat load of people wielding a fresh delivery of cigarettes and plastic bags arrives. While most of us go about our normal day not giving a second though about who will pick up that discarded nappy, or who will spend hours unravelling the kilometres of embedded fishing line from the reefs, it’s people like Sian who dedicate their time to tasks like this. Sian has developed some eco alternatives for divers interested in conservation, marine ecology or just wanting to give something back to the ocean. Learn how to identify broken, overturned live corals that with our help, have a second chance of survival. Learn how to safely pick up heavy corals and to find suitable substrate to transplant onto for the coral to attach to once overturned and secured. Dive includes all equipment including protective gloves and briefing on identification of corals to focus on and present reef state around the Gilis. Equipped with protective gloves and a mesh debris bag divers will go out in buddy teams to different reefs collecting as much non organic waste as possible. Dive includes protective gloves and mesh bag, briefing and Dive Against Debris ID guide to know what to look for and collect, data sheets to analyse debris data. Learn what a Biorock is whilst diving around the world’s largest concentration of Biorock reef structures. Briefing includes why the Gili islands reefs depend on artificial reef restoration. 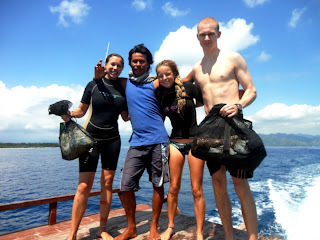 The basics of what a Biorock is and how it is advantageous to Gili islands tourism, fish populations and reefs. Help our volunteers’ check the structures are on, working properly and harbouring the correct corals. Bring along your underwater camera and get a picture on our very own Deus motorbike Biorock. Dive includes short briefing on the Biorock technology, how long our Biorocks have been established, the age and condition of each Biorock you will see. Learn about coral ecology and the importance of coral reefs in the marine environment. The course raises awareness to the state of coral reefs global and the need for awareness and responsible behaviour to protect remaining healthy reefs. Divers will also be introduced to the Biorock process and technology and why it is so successful. Take part in training to identify damaged coral reefs, the causes of destruction and the use of Biorock technology for restoration and erosion prevention. Learn how a Biorock works and why they are more successful than other reef restoration techniques. Will also gain an insight into how they are advantageous in preventing coastal erosion and eco tourism. Course includes 2 dives, at least one around the Biorock structures. The divers will learn to identify species of coral and the status of the corals on reefs and also on Biorock structures to compare. You will also learn how to recognize coral bleaching, disease and predation with underwater identification slates, whilst gaining a PADI speciality certification. Email info@trawangandive.com for more information.